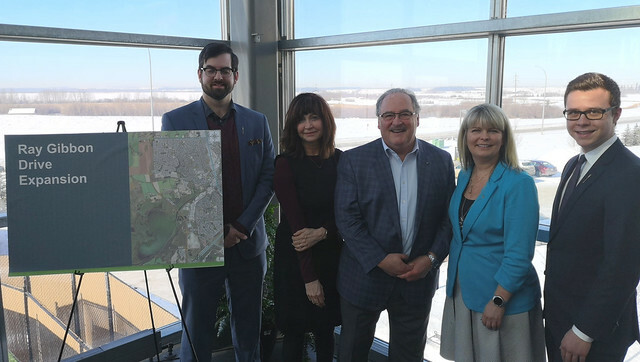 Widening Ray Gibbon Drive between Anthony Henday Drive and Villeneuve Road will enhance safety, improve commute times and reduce traffic congestion in the Edmonton Metropolitan Region. L-R: St Albert-Spruce Grove MLA Trevor Horne, St Albert MLA Marie Renaud, Minister Brian Mason, St Albert Mayor Cathy Heron, Edmonton Meadowlark MLA Jon Carson. More than 20,000 vehicles a day travel Ray Gibbon Drive, which connects St. Albert with Anthony Henday Drive, the Yellowhead highway and the City of Edmonton. A new cost-sharing agreement between the Government of Alberta and the City of St. Albert means design work for widening all eight kilometres of Ray Gibbon Drive can begin in 2019, with construction anticipated to begin in 2020. Twinning Ray Gibbon Drive is one of the top five priorities of the Edmonton Metropolitan Region Board. The $54.2-million project will be cost-shared 50-50 between the Government of Alberta and the City of St. Albert ($27.1 million each). The project will support 152 direct jobs.